Companies like Amazon and Uber run their business on analytics. There are 100 private companies in the USA which have grown more than 35 times in last 3 years. There are 3300 companies in 2015 list of Inc. 5000 fastest growing companies that have more than doubled in last 3 years. Get the complete study at Fastest Growing Companies. Jet.com - US based shopping website with real-time pricing algorithm has broken all unicorn fast growth speed records. Its $1 billion valuation occurred just four months after it was founded. Airbnb is an incredible growth story. Airbnb founders had a gut instinct that hosts with professional photographs will get more bookings. They created an MVP (Minimum Viable Product) and started experimenting and analyzing the impact of professionally photographed listings on bookings. Initial results showed that professionally photographed listings got two to three times more bookings than the market average. This validated the founders' hypothesis. Also, it turned out that hosts welcomed Airbnb offer to take professional photographs from them. The key metric that Airbnb started to track was shoots per month. It had already proven that more professional photographs meant more business. They provided professional photography as a service when renters called in. 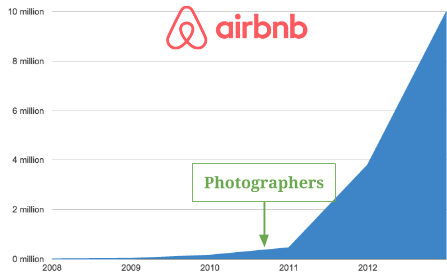 By Feb 2012, Airbnb was doing nearly 5000 shoots per month and continued to accelerate their growth. Growth case-study - SaaS retention. Sales Analytics - important metrics to track. Growth Insight - Get out of commodity hell. Does your company needs to hire a dedicated Growth Manager? How do you define Growth Analytics? 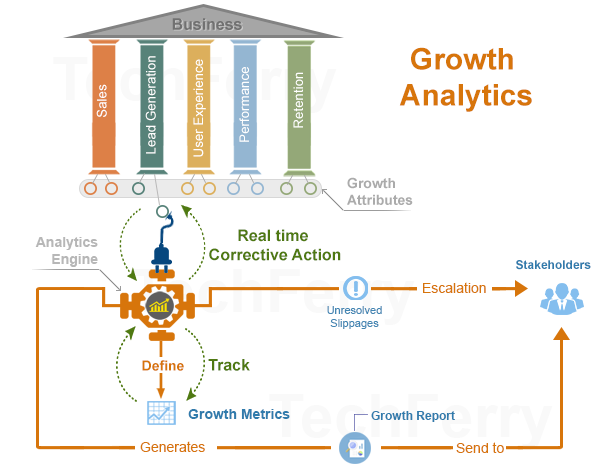 Growth Analytics looks at all the important pillars of growth like Sales, Lead Generation, User Experience, Performance, Retention etc. For each of these important areas, the goal is to identify growth attributes and define a growth metric that is proven to give you growth. We must prove and quantify the correlation between this growth metric and actual growth. For example, for AirBnB, professional photographs get 2-3 times more bookings. Hence, shoots per month is a good forward metric to track. The Growth Analytics engine uses a combination of AI - human hybrid intelligence to find key insights for your growth; it helps define and track growth metric. Growth Area >> Growth Attributes >> Growth Metrics. Growth Analytics doesn't stop at defining and tracking Growth Metrics. By now, we already know growth attributes or factors that improve growth metric. It captures slippages in real time, and takes corrective action immediately. If a slippage is not addressed timely, an escalation is raised. Growth Metrics >> Real time corrective action >> Growth Report. Finally, a report of not only growth metrics but also slippages, corrective actions, escalations is shared with management. Innovation is hard work - harder than most people realize. How do we find one insight that can put your company on fast growth track? Can we find out a key metric that is right for your business and acting on it is proven to give you growth? Over the past few years, TechFerry has helped many companies with Growth Analytics. Email us at info@techferry.com and we will help find the right metric for you - which can put your company on fast growth. You can also leave us a reply at the bottom of this page to get your business analyzed for growth. Can we create a model for my business growth? Can growth analytics be done for my business? Will it put my business on fast growth trajectory? Growth Case Study: Retention for SaaS based companies. For SaaS (Software as a service) companies, retention is crucial for growth. 5% churn per annum is good. Churn above that needs attention. Some SaaS companies face churn as high as 30% per annum. Some see 30% or more churn in first 60-90 days after sign up. How can you grow your business with such high churn? TechFerry recently helped a SaaS company analyze retention. There were 10+ parameters on product usage data that we needed to correlate with client retention. The aim was to first determine which factors impact retention and to what extent. Based on results by this machine learning exercise, we created a forward metric and a retention score (0-100). The clients with retention score above 60 were more likely to renew. Clients with retention score 40-60 needed attention and intervention - a set of suggestive actions were planned to move these clients up the value chain. Client with score less than 40 were marked inactive clients and they were handled with separate strategies. A dashboard was created for management to view the health score in real time. It contained important metrics like 'Score Average'. Average score targets were set. Action metrics were defined for customers segmented in 40-60 and 0-40 score. If you want more information, please request your copy of this growth case-study by emailing us at info@techferry.com now. 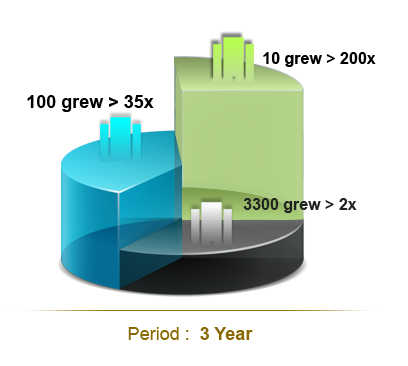 You can also leave us a reply at the bottom of this page to get your business analyzed for growth. Lead Scoring: Score your leads on a scale of 1 to 100. Potential buyers with fewer than 65 points are "prospects"; potential buyers with more than 65 points are "leads". The higher the number of points, the hotter the lead. Can we get out of this commodity hell? What do you suggest if we sell commodity? By the way, does Nike sell shoes - a commodity? Growth Insight: Get out of commodity hell. If you sell homes, sell locality, neighbors, schools and activities near by. That makes your home in the locality you just sold more important. If you sell furniture, sell your store and its focus on quality and overall home design. Sell the dedication of store owner to its customers. If you sell shoes, study the feet, fashion and footwear. There are 214,000 nerve endings in your feet, for example, that connect to every organ in the body. Your feet sweat about a cup of moisture per day. The quality of the shoe makes a huge difference in whether your shoes will allow this moisture to properly escape or build up bacteria. Question: What should growth analytic focus on? Your product, your customers or your market? Does your company needs to hire a dedicated Growth Manager � alternatively Growth Hacker, Growth PM, or Head of Growth? What does this role of Growth Manger exactly means? The Growth Manager function typically lives at the intersection of marketing and product development, and is focused on customer and user acquisition, activation, retention, and upsell. Data is the fuel of the growth function and growth teams invest a significant share of their resources to create the infrastructure that enables analysis of user behavior, scientific experimentation, and targeted promotions. At TechFerry, we have developed tools and infrastructure, which have been proven in production environment for many growth functions for many of our clients. If you decide to work with TechFerry for your growth needs, you will be able to utilize our tools, ready made growth models and growth functions and our infrastructure right away. AirBNB (via Criagslist cross posting), DropBox (Free extra space for those who share), Hotmail (Powered by Hotmail. Get your Free email footer) are the best examples of companies growing on virality. Analytics is the blood that flows through the veins of a growth hacker. Analytics keep growth hackers honest. Analytics is the measurement of movement towards your business goals (sales/retention). Analytics is not about the tools you use, it is not about slicing and dicing and presenting information in amazing visuals. How do you Anchor analytics to strategy? Ability to identify leading causal factor, tinkering with is guaranteed to improve performance over time. It is about using the right metrics. Right metrics can change the way you look at things. Can your analytics provider highlight the things you don't know that you don't know. If data is the fuel of growth, then analytics is its engine. Jet.com - an e-commerce startup with real-time pricing algorithm (which has broken all unicorn fast growth speed records) had an unusual technique to get people talking about it. It offered thousands of dollars worth of stock to normal people who refer a lot of their friends to the service, as well a early access and six-month free membership. Normal people can get early stock by sharing their unique code and getting other people to sign up. The ten people with the most referrals get 10,000 shares and the number one referrer gets 100,000 shares. Jet says that's the same amount it has given some of its earliest high-level employees. The winner brought 8,167 referrals spending around $18,000 in online advertisements. Others in top 10 brought more than 2000 referrals each. More than 300,000 people signed up for this contest referring their friends. Stickiness is an important factor for customer retention and long term success. Long term stickiness often comes from the value users create for themselves as they use the service. It is hard for people to leave Gmail because that is where they store all their stuff. Similarly, if a player deletes his account from a massively multi-player online game, he loses all his status and in-game items, which he's worked hard to earn. If you want more information or if you are interested in any of our growth case studies or healthcare analytics case studies, email us at info@techferry.com now. You can also leave us a reply at the bottom of this page to get your business analyzed for growth.